Congratulations — you are down to the last 5 days of the November to Remember, No Excuses November, 30-day challenge 2015 to do the scaled-down version of the Parkinson’s Recipe for Recovery®. Also, here in the States, we are preparing for Thanksgiving tomorrow. For many, it will be a time for seeing relatives and friends. There is much for which to be thankful, and I feel we all know this. However, a big part of making this Thanksgiving holiday wonderful and memorable, is the addition of one ingredient that you do not eat…compassion…for others and for yourself. Thanksgiving is a good time to give thanks and gratitude, but also, it is a good time to revisit kindness and compassion. Prior to my recovery from Parkinson’s Disease, the only other person I had met who had Parkinson’s was my mother. She was one of the kindest, most giving people you ever would have had the pleasure of knowing…kind and giving to others…not herself. 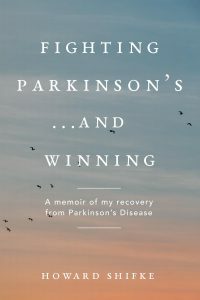 Over the last five and a half years, I have met with, spoken to, Skyped with, FaceTimed with, and exchanged emails with, hundreds of people with Parkinson’s. You are some of the kindest and most giving people I have met…kind and giving to others…not yourselves. I was the same way. Part of this recovery is learning to be kind to yourself. And, as a result of the expectation that you have to be perfect, you never stop thinking and thinking and thinking and thinking and thinking…your Adrenaline-mode mind does not stop. Because, to be perfect, you realize at some level that there are multiple exceptions that go to every rule, and there are multiple corollaries that go to every theorem, and there are multiple options that go with every choice…and you have to run them all down and solve them all, and they keep branching out into more exceptions and more corollaries and more options, and you can see where this cycle goes…it is endless. For those of you without Parkinson’s, this scenario may seem strange and stressful. For those of you with Parkinson’s, I know many of you are reading this and thinking, “So, what’s your point. This is how things work, no big deal.” Here is my point: Thinking this way is a BIG DEAL! It cuts across all three causes of what brings Parkinson’s to the surface as diagnosable symptoms. The anger and frustration and resentment and stress and anxiety make it difficult to eat properly and you suffer from dietary disaster. Solving all these problems becomes more important than what or when or how you eat. You burn the candle at both ends and in the middle and your mind never stops thinking, which completely wears it down and upsets your body’s natural rhythms. So, how do you reverse this mess? Begin by being kind to yourself. 1. Look in the mirror and say, “I am not perfect.” For many of you, I know this will take some courage and resolve. The rest of us will patiently wait while you go take care of this. It is that important! 3. I know, lots of time in the mirror — Go back to the mirror and say, “When I am doing my best, it IS good enough.” This one seems logical, but it is not. Many of you have told me, “I am doing my best, but I do not think it is good enough.” Your best is your best; you cannot do any better than that. Be kind to yourself and accept that if you are doing your best, it is the best you can do, and it is good enough. That is the formula to being kind to yourself. When somebody else falls short of an accomplishment, you offer them compassion and comfort and say, “That’s okay, you did your best, you have nothing to be ashamed of. It just wasn’t meant to happen.” Being kind to yourself means offering yourself the exact same compassion and comfort you offer others in the same circumstances. The Recipe is a soul, mind, and body recovery. If you do the body part (Qigong) and at the end, you say to yourself, “I did not do that Qigong perfectly or even good enough, so I probably will not recover,” you have moved backwards. Whatever benefit you have gained for the body is great, but your mind is in negative (self-criticizing) mode, and your soul is losing faith in recovery. At the conclusion of doing the Qigong, say to yourself, “In this moment of doing Qigong, I did the best possible Qigong that my Parkinson’s body would allow and I did great in moving forward with my recovery!” That attitude propels your mind with positive thinking, and it propels your soul with continuing faith and hope in your recovery. There is nothing wrong with being kind to yourself. In fact, being kind to yourself will liberate you as you move forward on your path toward recovery. So, while you are continuing to be kind to others, keep the happiness and joy and compassion alive by being kind to yourself. When others ask to assist you with preparing your Thanksgiving holiday, be compassionate to them, smile a big smile, and say, “Yes, I would love your help.” If somebody says, “May I assist you to the Thanksgiving table,” be compassionate to them, smile a big smile, and say, “Yes, I would love your help.” By doing this, you allow them to feel good about being able to do something for you. However, prior to doing this, you need to find compassion for yourself and your situation with Parkinson’s. Otherwise, you either do not accept the help you need or the person feels badly in helping you because you are feeling badly about yourself…and it shows. Did it ever occur to you that you can be of service to others by the simple act of graciously accepting their assistance if they offer? Yes, service to others by providing them the opportunity to unconditionally provide a helping hand to you. You both come away from the interaction feeling great. So, please feel compassion for yourself and graciously accept whatever assistance you are being offered. Oh, yes, that feeling you get inside when you do this is your heart opening and your Dopamine flowing. That is why it feels so good. Find kindness and compassion for yourself, and make this your best Thanksgiving ever!!! Make the commitment to cure yourself from Parkinson’s! Yes you are. Each and every one of you is WORTH IT!!! Tomorrow is Thanksgiving and I’d like to take this time right now and thank you for all the hope, knowledge and love you have given me. When i was diagnosed back in June i was in a dark place as matter of fact I’ve been in this dark place since Jan 2013 knowing something wasn’t right with me. If my wife never found you I would have been lost but you have been a light of hope for me in a very scary dark tunnel. I’ve always said “the power that created you, is the power that can heal you”for those of you reading this PARKINSON’S IS CURABLE! Its all in your attitude and in your faith. God must have thought we were important enough to allow this to happen to us he is testing our strengths are faith for our faith is stronger than our Parkinson’s. Thank you Howard and Happy Thanksgiving to all! Hi Howard, Tony has said all I feel in my heart that I would like to say to you. I would like to take this Thanksgiving opportunity to thank you for all you’ve done for me /us. Thanks Tony for your words that help me to express to Howard. We are Thankful that we founded you , and you are our Tour Guide to the way of Recovery. Hard to imagine , where we should be by now with out your every day of support. Hi Howard, fab post. I am really not being kind to myself as I keep my focus on how tough it is right now, rather than how well I am doing. It’s a challenge when these symptoms have gone on for what seems like forever. It’s surrendering to Gods time and his wisdom. I am also disappointed as I truly thought I would be healed completely in 2015, again, Gods time, not mine. I need to keep reminding myself that this is just the way it is meant to be right now and necessary for my recovery. Although here in Ireland, I would like to say for thanksgiving, that I am thankful for you Howard and my amazing warrior comrades here on this site, who ground me and keep me from ” overwhelm” with their share each week. It’s a gift not walking this walk alone and to chat to so many who understand, I am thankful for you all. Happy happy thanksgiving to all my American buddies. Have a joyous day! It often feels like it’ll never end but just keep in mind ‘that this too shall end’. I have to remind myself of that on a regular basis. Feeling supported goes a long way to climb out of that so by sharing youre helping us and yourself. Together we’ll be victorious! Cheers Waseema, yes we shall my friend, yes we shall. I second that Waseema! It feels a bit of a slog at the moment and I am so grateful to Howard and my fellow warriors. We spur one another on and we will get to the finishing line. Keep chipping everyone, we will be that shiny teapot! This is a day to express our thanks first to God. His love for each one of us is boundless. I’m so thankful that He guided me to this blog and to Howard, out of the darkness and into the light, where I find hope and encouragement. Howard, you are a godsend! ALL of you by sharing your ups and downs on this journey have become the friends I needed to accompany me on this road! THANK YOU!!! Best wishes to all for a Happy Thanksgiving! Pour yourself a big cup of gratitude, and drink it down, celebrating how well you are doing in your Recovery! Cheers! (Rather than engaged in the thinking thinking thinking adrenaline mode) then regardless of how well you move your body, you are definitely doing it well enough! Qigong is energy work and developing mind -body connection. If you did the movements “perfectly” from an outside of the body perspective, executing each move well, but with your mind not fully engaged, you are really just doing exercise. You can do great qigong while sitting in a chair and only moving the body to the extent that is easy. If you cannot bend over, in your mind, picture yourself stretching effortlessly all the way til your fingers touch the floor. Intend for your body to do that, even if it cannot physically make that move. If your arms can’t lift easily over your head, lift them as high as you can and then intend and visualize them continuing the rest of the way, effortlessly, like they are just floating up. “How well” you are doing qigong cannot be seen and can really only be gauged by what you experience inside you. Like chipping at that iceberg from inside! Chip chip chip. With tremendous thanks to Howard for the Recipe for Recovery, which has changed my life beyond my wildest dreams! Thank you, thank you, thank you! Thank you, Marie. This is really clear and helpful. That has brought some clarity. Thank you, Marie, for that added understanding and articulation of energetic focus and intention when doing the qigong part of the recipe. It helps a lot. Thanks Marie. This helps me with my doubt that I can’t physically do some movement right. My heart is filled to the brim with gratitude today. I am so thankful for so many things. I will just mention a very few. I am thankful for the life that I have been given. I am thankful for my health, for my family and friends. I am thankful for the beautiful world I live in. I am thankful for the peace and freedom that I enjoy. I am thankful for Howard’s (as always) timely message. The thinking and thinking and over thinking things was so me…. until today 🙂 I have the ability to change and I am choosing to do just that. I love and accept myself and my ability to do my best, right now. I know my best is good enough. I am not perfect, and I do not need to be perfect to be successful or happy. I am happily living right now in the moment. I will do what I can and then turn the rest over to God so that I can use my energy on positive things . Thanks Howard. Here is a little funny that maybe some of you can relate to. I am thankful for each of you for sharing so much of yourselves with me. Thank you Howard, just what I needed to hear. I related to all of that. I Now accept myself , and I practice being compassionate with me Helen. Thank you Divine Spirit in me and without me. Wishing everyone a happy and compassionate Thanksgiving. And thank you, Howard, for helping us to turn every day into a day for thanks-giving. Howard wish you and Sally A Very Happy Thanksgiving. To all my felloow warriors wish you all A very Happy Thanksgiving. Howard Thank you is too small a word to express my gratitude for you. The light of hope that you have bestowed on me is simply immeasurable. On this day of Thanksgiving I wish to bow down to you Howard for giving me the hope to a second life after my recovery. Happy Thanksgiving everyone …even though our Canadian Thanksgiving is held in October, it’s really quite wonderful to have the energetic experience all over again through these heartening posts. I’ve very grateful, Marie, for your sharing and advice…I will add your suggestions to my recovery process. Also, Howard, I am exceedingly grateful for this week’s coaching and your sharing of the phrase, “Where will my next thought come from?”…I’ve been practicing this again and again and again since our call. It certainly is helping me slide into my heart with regularity, focus, and gratitude for living. In a funny way perhaps, I’m grateful that the PD experience is offering me much deeper awareness than I might otherwise have had…every experience has its purpose I guess…if only I’m willing to open my heart and allow myself to fold inside. I am from Canada but now live in the United States. It is great to have two days to feel a little extra energetic experience from thankfulness. I love the question of ” where will my next thought come from? ” I also love how you worded this beautiful and powerful thought.…if only I’m willing to open my heart and allow myself to fold inside. Thanks for sharing. Have the best day ever…. as it is the day we have been given to live in the now. Thank-you, Howard. We have read this before, but it bears repeating…..great concrete help and encouragement. howard, was du schreibst, erklärt vieles. deine worte trösten mich und geben mir hoffnung. danke..
Howard, what you write, explains much. your words comfort me and give me hope. thank you..
thankyou karen, i will write more when i’m able.. Welcome to the group Rali. I’ve only just seen the question you asked me on the previous post. I’ve now responded to it.